Earlier I have showed you all the functions of the Sally Hansen's products and now it's time to show you how they are put in action. Last month I went to Sally Hansen's HQ for a workshop and I will pass on what I've learn in this workshop in this post for you guys. If you read until the bottom (or skip through), I will be giving away FOUR (4) bottles of Triple Shine nail polish to TWO (2) winners, each person gets two bottles. And you can choose your own color! Drop one drop of the Instant Cuticle Remover and spread it around the cuticle. Let it sit for about 15 seconds to dissolve the cuticles, then use a cuticle stick to push in the cuticles. Rinse of the remains with water. Tips: Whenever you visit the salon, the manicurist often trim your cuticles. This is extremely dangerous because your cuticles will be exposed. You might get infection when in contact with bacterias or viruses. Apply the Sally Hansen's Vitamin E Nail & Cuticle Oil on your nail. Leave it for 10 minutes. Then rinse it off. Tip: If you have extremely dry cuticles, hand cream is not enough to do the job. The Vitamin E oil absorbs faster and provides more nourishment compared to hand cream. Apply this overnight for best result. I use the Hard as Nails (Nail Hardener) as base coat. The nail hardener can be worn by itself to strengthen your nails. If your nails tend to chip off easily, you should get this. Tips: Using Hard as Nails as base coat will prevent all the damage cause by nail polish. It protects your nail and harden it at the same time. This is pretty much self-explanatory. 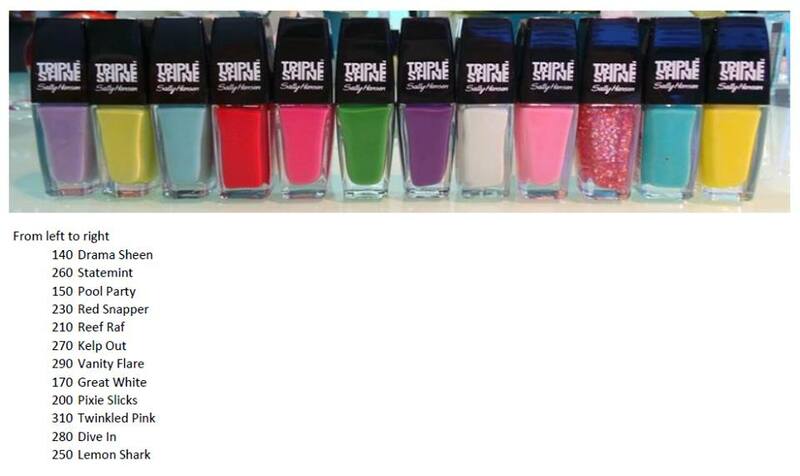 Paint your nails with the Triple Shine nail color. This nail polish comes with a flat and rounded tip brush for easy application. This brush is idiot-proof. It's okay if you don't have a stable hand to paint nail polish, the brush will make you look like a pro. Look how neat my nail polish is. And I don't even have professional practice! You can end your manicure with a top coat once you apply your nail color. Or you can add on some artistic touch. I use striping tape to create stripes. Then apply second coat of nail polish and remove the striping tape before the nail polish dries. Tips: You can try various nail art tools like sponge to create ombre effect or dotting tools to create flowers and heart shape. Seal your nail polish or nail art with a top coat. The Insta-Dri is my current favorite. Not only it dries the nail polish faster, it gives a glossy effect on the nail polish. Unlike other fast-drying top coat that dries only the surface, the Insta-Dri dries the manicure completely within 30 seconds. Tips: When in the rush, apply the Insta-Dri before you apply the second coat of nail polish. It dries the nail polish in between quicker. Usually manicure takes about one hour to dry completely. But if you apply the Insta-Dri in between, it takes about 25 minutes to dry off completely. Here is the result of my nail art!!! For the above nail art, I use Great White as the base and for the top layer, I use Dive In and Reef-Raf. What do you think of my nail art? My momma tell me, good things must share with friends. So I'm going to giveaway four bottles of the Sally Hansen Triple Shine nail polish. There will be two winners. Each get two bottles. And the best thing is.... You can choose your own color!!! Here's how to enter... LIKE Sally Hansen Malaysia's Facebook page. Then comment on this post. I will pick the best and creative comment. If you're not sure what to comment, you can write "I deserve the Triple Shine nail polish because..." or you can state the color you want with nail art ideas. I will pick the two winners. Deadline is 27th June 2014. Decided which color to get? It's a tough choice like I said. I want to get all of it. If you want to get a more explanation for each of the product I use above, you can check out my Sally Hansen's haul <<here>>. Thank you for reading and good luck! "I deserve the Triple Shine nail polish because firstly the brush provided will totally help me in painting my nails to look like a pro and secondly how can anyone not love the colors of the Sally Hansen collection? Would totally love Twinkled Pink and Pixie Slicks since I can't get enough of sparkly nails especially in PINK!! I will have beautiful pink sparkly nails that looks like it was done at a nail salon!" I love the “Pixie Slicks” and “ Twinkled Pink”!!!! I would choose 210 Reef Raf & 310 Twinkled Pink to come up with an awesome gradation nail. The girly colours would be great to wear everyday or for more formal events, thanks to that extra BLING! Hey Jerine! Your nail design is so nice!! Well I guess the pretty nail colours make everything looks better as well hehe! I have no talent in doing nail design so I always stick to the basic, just apply the nail colour on my nails then I'm happy with it haha~ I tried some DIY design like polka dots and stripes but they turned out to be really ugly and messy (sigh....) so I remove them from my nails :( Haha I guess I don't have mush talent in this field. You did a demo for Bloop fake nails remember? If I want some fancy design on my nails then I will go for those, just glue it, easy and simple! Thanks for the giveaway yo! i like the new applicator! great for idiot like me :/ i always find it hard to apply on my right fingers.. I'll have Nos. 2 and 3; "Great White" & "Dive in". Thank you.